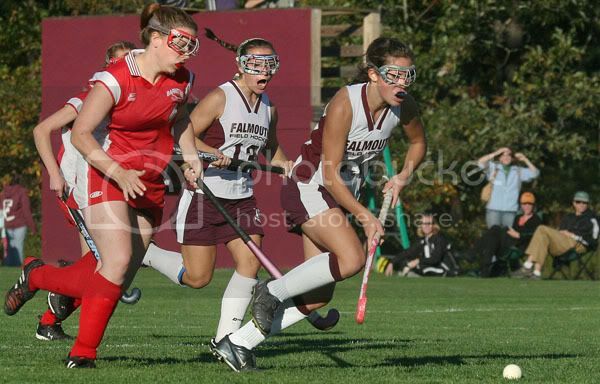 Falmouth - Falmouth High School sophomore Virginia Muma netted two goals and senior Kelsey Rigby scored one to pace the Clippers to a 3-2 victory over arch rivals Barnstable High School on Monday afternoon. The contest was fast and physical, and was the second meeting of the two squads this season, the first ending in a tie. The visiting Red Raiders (13-1-3), who clinched the Old Colony League title on Thursday, kept the Clippers busy with 14 shots on goal. 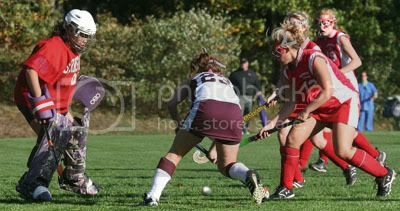 Falmouth's tender, sophomore Shea Callahan, allowed two scores, twice what she had allowed through all previous 14 games. Falmouth (14-0-1) struck first at 24:42 in the first period when a flurry of action in the circle led to a penalty corner, giving Muma a chance to find the backstop. Falmouth held onto the momentum until 3:00 in the first period when Barnstable's Lynne Donoghue got one past Shea Callahan, knotting things up at one goal apiece. The intensity continued into the second period with both teams leading spirited attacks on their opponents goals. 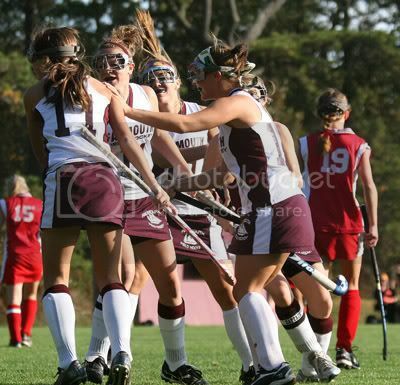 Muma gave Falmouth the lead @ 25:50 when she scored on a breakaway. Kelsey Rigby added some insurance with her blow to the backstop @ 5:46. The Red Raiders came right back at the Clippers and drew a penalty shot when goalie Shea Callahan fell on a blocked shot. 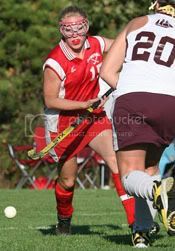 Kristen Logan went high left past Callahan at 4:34 to bring Barnstable within 1. Falmouth held on to win 3-2. Barnstable's goaltender Catherine McAllister had nine saves and Falmouth's Callahan had five, including two big ones late in the second period. Falmouth had seven penalty corners while Barnstable only had four. The win brings the Clippers record to 14-0-1 while Barnstable goes to 13-1-3. Both teams have qualified for the MIAA South Sectional tournament. Barnstable travels to Dartmouth on Thursday with a 4:00 PM start and Falmouth takes on Nauset on Wednesday and Dennis-Yarmouth on Friday, both games @ 3:30 PM at Falmouth.